This is one of the best hikes in the San Gabriels Mountains. You hike up the heart of scenic Icehouse Canyon into the Cucamonga Wilderness to Icehouse Saddle, then to the top of the 8303-foot Timber Mountain. This summit is one of the Three T's, a group of peaks which include Thunder Mountain (8587'), Telegraph Peak (8985'), and Timber Mountain (8303'). (See my write-up for Telegraph/Thunder.) A popular hike among the Sierra Club peak-baggers is to ascend all three peaks in a single hike, using the roller coaster Three T's Trail which runs from Thunder Mountain (1.5 miles south of Baldy Notch) south to Icehouse Saddle. The views from Timber Mt. are not as reaching as from Telegraph Peak, its taller counterpart to the north, but the splendid rewards of hiking to Timber Mt. are well work the effort. This is a great summer hike with plenty of sunshine, pleasant temperatures, and long days. But check the weather reports for possible thunderstorms and make sure you carry the 10 essentials. The higher elevations can get a lot of snow in the winter, so check the trail conditions if you're hiking late fall or early spring. From the new 210 Freeway extension, driving east: Exit Baseline Road in Claremont. Turn left on Baseline. In one block turn right unto Padua Avenue. In 1.7 miles turn right onto Mt. Baldy Road (stop sign). After 7.2 miles you pass the Angles National Forest Mt. Baldy Visitor Center in Mt. Baldy Village. You can get a Forest Adventure Pass and wilderness permit here. Continue 1.5 miles to the Icehouse Canyon entrance. Turn right and park in the large parking area. From the new 210 Freeway extension, driving west: In Upland, exit Mountain Ave./Mt. Baldy Exit, Exit 54. Turn right and proceed north on Mountain Ave. Drive 5 miles to Mt. Baldy Road. Turn right (north) and after 5 miles you pass the Angles National Forest Mt. Baldy Visitor Center in Mt. Baldy Village. You can get a Forest Adventure Pass and wilderness permit here. Continue 1.5 miles to the Icehouse Canyon entrance. Turn right and park in the large parking area. 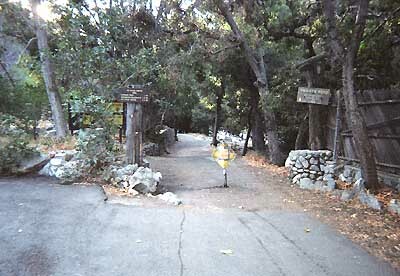 The trail starts at the east end of the parking lot , just to the right of the ruins to the old Icehouse Canyon Resort. A National Forest Adventure Pass is required for parking. From the trailhead follow the path east, under a canopy of oak, alder, spruce, cedar, fir, and pine. You'll pass a few old cabins and cabin ruins. The creek provides a delightful sound track as it dances to your right. After one mile you reach the junction of the Chapman Trail. Continue straight on the Icehouse Canyon Trail. After another 0.8 miles you reach the entrance to the Cucamonga Wilderness, the trail now being on the south bank. The forest is more open at this point and as you proceed up the canyon, you begin to enjoy some nice views. The trail crosses back to the north side of the canyon, and after a few minutes you pass a 2-mile marker. The trail gets steeper and in about 10 or 12 minutes you are greeted by the refreshing water of Columbine Spring, 2.4 miles from the start, and high on the north slope above the canyon floor. After the spring you'll do some more switchbacking. Just shy of 3 miles from the start of your trip you reach the upper junction of the Chapman Trail. Continue up canyon and after another half mile you'll reach Icehouse Saddle. Looking southwest toward Big Horn Peak (right) and Ontario Peak from atop Timber Mountain. View Large image. Here at the saddle the sky is blue, the air is clear, the forest is mature, the views are impressive, and the breeze is refreshing. To continue on to Timber Mountain, take the trail to the left (north). Follow the trail as it switchbacks up the southwest facing slope of Timber. At the west ridge before the trail heads down to the saddle between Timber Mountain and Telegraph Peak, turn right (east) on the spur trail, following it 0.25 mile to the summit. It used to be called Chapman Peak, so indicated by the old peak register container attached to the big tree that greets you on the summit. Since Timber Mountain is indeed decorated with timber, you'll want to wander around the summit area to take in the views in all directions. If you've brought a cell phone, try calling home and say hi to the family. I got good reception. Trail conditions: This classic, hand-built, single-track trail is well traveled and usually in reasonable condition. Typically in a few places there is loose rock on the trial, fallen from the steep scree slopes or along the route where the trail follows over or near the creek bed. Connoisseurs of good trails will appreciate the nice rock work along the way, particularly on the lower end. Good signage. 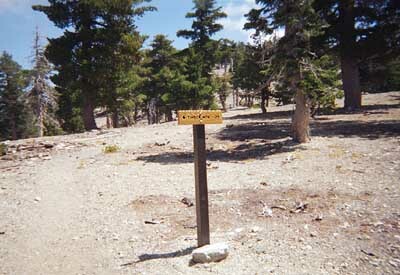 At Icehouse Saddle and along the Three T's Trail north, the attractive trail signs were installed in summer 2003, a service project by Eagle Scout candidate Ben Crocket and volunteers. Elevations: Nothing complicated here. 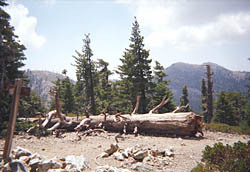 The trailhead at Icehouse Canyon is 4900' (according to the Tom Harrison mapAngeles High Country Trail Map) and the peak is 8303'. The route climbs steadily throughout with virtually no up-and-down roller coaster action. Thus, simple subtraction gives us an accurate gain of 3403'. Schad puts the trailhead at 4920', so if you'd like, you can subtract 20' from your total gain, 3383'. However, I figure that there's at least 20' of some extra coaster action, so I have no problem claiming a climb of 3400. Mileage: The trailhead sign reads 3.6 miles to Icehouse Saddle. The Tom Harrison map (Angeles High Country Trail Map) puts it at 3.4. Jerry Schad: 3.5. Robinson, McKinney, and Chester have it at 4.0 (most likely a good half mile off). In comparing all the mileage figures from the signs, Schad, and Harrison, all are within a tenth of a mile of each other. I think it would be safe to settle on a distance of 3.5 to the saddle. 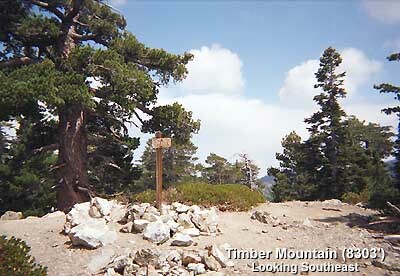 From Icehouse Saddle to Timber Mountain: The trail sign at the saddle reads Timber Mt. 0.9. It's not clear whether that mileage is for the actual peak or for the junction below the peak. Harrison puts the distance to the junction at 0.7. The trail sign at the junction shows 0.25 to the peak. The new trail signs usually correspond exactly with the Harrison map. So maybe the Harrison distance is actually 0.65 rounded up to 0.7. Or maybe the trial sign rounds it from 0.2 to an even quarter mile. At any rate, for the distance from the saddle to the peak, 1 mile would seem to be pretty accurate. And heck, you could easily add on another 2 or 3 tenths of a mile just walking around the summit taking in the views. So my 9.0-mile distance for the hike is based on 3.5 to the saddle and 1.0 to the peak, 4.5 one way. People traffic: This is an immensely popular trail, one of the busiest in the San Gabriel Mountains. On a typical weekend day there are dozens and dozens of hikes. Even on a weekday you will share the trail with others. The numbers thin out as you get higher, since the lower portion of the trail is used a lot by casual walkers and families with children. Most of hikers on the trail that I've talked with have hiked this trail numerous times. Walked up the Ontario Peak trail .5 mi. Looking east down into the Middle Fork Lytle Creek from the south slope just below the summit of Timber Mountain. 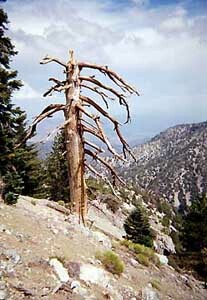 LocalHikes.com - "Timber Mountain via Icehouse Canyon" - by Dan Simpson, yours truly. An abbreviated version of this present description: Brief summery. Driving directions. Photos. Topo map. Hundred Peaks Section, Angeles Chapter, Sierra Club Peak 17D "Timber Mountain" - Brief driving directions and route descriptions. Brief historical background. Puts distance to saddle at 4.0 miles (probably 0.5 mile too much). 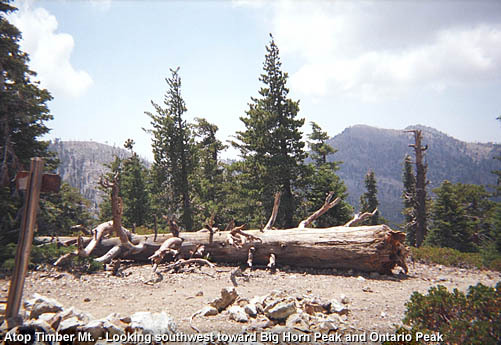 Hikes #95 - 95.3 Baldy Notch to Thunder, Telegraph, Timber Mtns., Icehouse Saddle, Icehouse Canyon - by Tom Chester. Overview, trail description, and discussions of mileage and elevations. Only a portion applies to this present hike. Puts distance to saddle at 4.0 miles (probably 0.5 mile too much). Trails of the Angeles: 100 Hikes in the San Gabriels - by John Robinson (Wilderness Press: Berkley). Hike 96: "Icehouse Canyon to Icehouse Saddle" - Good trail descriptions with historical background. Mileage is suspect. Hike 95: "Baldy Notch to Thunder, Telegraph, Timber Mountains, Icehouse Saddle, Icehouse Canyon" - Not too helpful in trail description for this present hike, but does offer some interesting background to the area and has a photo of a splendid specimen of metaphoric rock found in the canyon. Puts distance to saddle at 4.0 miles (probably 0.5 mile too much). This page was last updated April 3, 2010.